This is dedicated to my son, Avraham Benyamin (Ben) Porush, whose birthday is the first day of Chanukah and bris the last. Why does the Talmud warn against teaching Greek to Jewish children? Pythagoras traveled through the Middle East for twelve years, imbibing Egyptian & Jewish philosophy. The last pages of the Talmud volume Sotah portrays the decline of Jewish spirit after the destruction of the Temple. It marches through a long, dispiriting list of the horrible things that happen as Jews have to abandon customs that could only be kept alive when there was a spiritual center in Jerusalem and they lived as a nation inside their own borders. There were a thousand pupils in my father’s house; five hundred studied Torah and five hundred studied Greek wisdom. What is so wrong with Greek? We even have a whole holiday devoted to reminding us of Jewish allergy to Greek culture, Chanukah. The Greeks conquer Israel in 332 BCE. Around 167-165 BCE, the Greek king Antiochus IV, as part of his general purging of the Greek empire from foreign influence, outlaws Judaism and defiles the Temple. Judah the Hammer (Maccabee), recaptures and purifies it. He lights the lamp of the Temple, and miraculously one night’s worth of oil stays lit for eight nights. Chanukah’s lights are a reminder of the re-assertion of Jewish holiness over Greek idolatry and materialism. But Chanukah also should remind us of the challenge Jewish life continues to face from the sheer beauty and depth – the seductions – of Greek philosophy and its heirs in the modern world. Greek thought gave us science, democracy, great literature and art. Any Jew educated should appreciate the intrinsic beauty of Greek thought and its contributions to the foundations of Judaeo-Christian culture. But Jewish history replays the Chanukah drama in different forms throughout the Jews’ exile in the West, suggesting the rabbis of the Talmud were right to be worried, and they were prescient to warn Jews away from Greek. In 76-67 BCE – Aristobulus and Hyrkanos, great-grandnephews of Judah HaMaccabee, split the kingdom. Aristobulus lead the conservative Pharisees, trying to preserve the purity of Jewish ritual and the Temple as Hellensim, a century later, again creeps back to dominate Jewish culture. In the spirit of his grand-uncle, he seizes Jerusalem and the Temple to protect it. Hyrkanos, however, leads the urbane, progressive Seleucid [Greek] faction, Jews assimilated to Hellenism resisting the movement back to strict Jewish rituals and politics. They must have thought of themselves as liberal cosmopolites, sophisticated moderns. Why stop progress? The Greeks have put their stamp on a new and irresistible view of the world for centuries now. Why resist it by clinging to benighted old traditions and superstitions. Judah Maccabee was, after all, a religious zealot, a fundamentalist, and we would do well to finally put his bigotry behind us in favor of more enlightened culture. Hyrkanos besieges Aristobulus’ forces holding Jerusalem. What is the deeper meaning of this story of the traitor and the earthquake that shakes all the land of Israel? When the rabbis prohibit Greek wisdom, mythic fears are in play. Rashi [1040-1105 CE] explains that “Greek wisdom refers to a set of cryptic expressions or gestures understood only by the paladin (palace dwellers or the nobility), not by common people.” To what could he be referring? I think Rashi is suggesting the traitor knew specifics of Greek philosophy-theology from privileged Hellenic “higher” education that his more religious and plebian companions wouldn’t have known. Further, writing a millenium later, Rashi may be pointing to the enduring effect of the cult of Pythagoras, whose influence over all of Western thought, even into our twenty-first century, has remained strong in a way I will explain in a moment. But the most strikingly, Rashi points to the basis of the culture wars rocking Israel in the first century BCE in class divisions, ones we can also see play out throughout history: the privileged, assimilated urbane intellectuals against the retrograde and more fundamentalist nationalists. The wellspring of this deeper current is Pythagoras himself, whose worldview had profound influence beyond the Pythagorean Theorem we learned in middle school algebra and was so much more than mere mathematics. 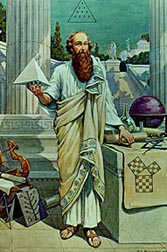 Pythagoras (570-490 BCE) is considered the father of Greek philosophy. The son of Greek nobility, around the age of twenty he travels around the Middle East and Mediterranean for twelve years. He visits Egypt. On his way back, he stops at Mt. Carmel to visit Elijah’s cave for several weeks. He then journeys to Babylon at a time that would have coincided with the Jewish exile. Inspired by the wisdom and mysticism of these other cultures, he returns to Greece and founds a mystic-scientific-cosmological-communal brotherhood preaching asceticism, mystical number theory, the “divine” tetractys, and the transmigration of souls. Today, we study the Pythagorean Theorem in math class but rarely, if ever, its religious and mystical origins. Yet these are tightly wound together in one coherent system of thought and behavior which we would recognize today as more of a religion than a mathematical or scientific discipline. By looking at the essentials of the Pythagoras’ teachings, we can capture this flavor. Reality is ONLY that which can be measured and understood, delved by rational numbers – the integers (1,2,3, …) and fractions created by ratios of integers (1/2, 1/3, 1/4, etc). He invents word philosophy – that is, lover of knowledge. He inspires Plato’s distinction between being and becoming: the notion that the cosmos is governed by rational laws that are fixed, constant, and universal, despite the apparent chaos of existence. In turn, he inspires Aristotle’s rational, orderly vision of cosmology: the universe can be arranged and ordered into a complete, coherent, unified system. It is governed by logic. Reason is the highest attribute of human nature. To be rational is also to be ethical and therefore, divine. The sign of the cult is the mystical Tetractys seems to be an idea of numbers Pythagoras melds with the Jewish Tetragrammaton, the Four Divine Letters of God’s Name, that he might have picked up on his journey through ancient Israel…. Pythagoras’ Tetractys symbolized how numbers reveal a mystical order in the cosmos: they add to each other following a path from top to bottom (1+2+4=7; 1+3+6=10, etc.). Pythagoras also taught a theory of Arithmetika theologomena, virtually equivalent to the Jewish gematria, the system of calculating Hebrew letters as numbers to discover further meaning, God’s secret intention, in corresponding values. Maybe Pythagoras imported the concept from his contact with Judaic mysteries in Israel and Babylon. The word gematria is Greek: ‘gamma + tria’ are the letter and number for ‘3’ put together. He believed in the transmigration of souls – a Jewish concept of gilgulim. The soul needs to be freed from the “muddy vesture of decay” of the body by ascetic practices, vegetarianism, and secret wisdom. Matter is evil. Contemplation of the universe from reason – rational thought – is the highest human activity. Pythagoreans also communicated via a system of secret signs, numerical codes, and hand gestures which they used while enforcing their famous discipline of ascetic silence, reminding us of Rashi’s cryptic comment about the cryptography of the Hyrcanus traitors. One of these signs, in fact the only one we know of for sure that survives to today, is the same as the split-fingered gesture of the Kohanim, which Pythagoreans used for “salut,” a deep concept signifying cleanliness, purity, ethical truth, and blessing or greeting. Maybe this is precisely the secret code the old man used to betray Jerusalem to the Greek sympathizers. Further, Pythagoras had something of the Godfather in him. According to legend, the brilliant philosopher Eudoxos of Knidos, discovered irrational numbers like the √2 or π, numbers whose decimals go on forever and can’t be expressed as the ratio of two integers. Eager to tell Pythagoras’ student of his breakthrough, he boards a Pythagorean cruise, a floating symposium of cultists. Mysteriously, he never debarks and disappears forever. One could see how the Seleucid Jews would find assimilation so attractive, and why Jewish thinkers and students could be seduced, even from within the walls of Jerusalem itself. Pythagoreanism was a seductive and powerful philosophy, a form of secular/pagan theology that would have been, and continues to be, attractive to Jews, with our love of learning and wisdom, science and esoteric knowledge. The Greek worldview, in one form or another, must have seemed, and continues to seem, to be the essence of enlightenment and modernism. Yet, to the rabbis of the Talmud, Greek wisdom, the secret Pythagorean code, it was the essence of assimilation and in their wisdom perhaps they say how it would continue to threaten Jewish existence. When the hoof of the swine touches Jerusalem’s walls, the entire foundation of Israel itself shakes. Indeed, between the second century BCE and second century CE, during the era of the Talmud, Pythagoreanism enjoys a huge revival in Roman culture, what we now call neo-Pythagoreanism. Cicero, the famous Roman senator, and his good friend in the Senate, Nigidius Figulus, lead the revival around 50 BCE. Nigidius writes a 27-volume treatise of mathematics, grammar, astronomy and magic that becomes a classic, along with Cicero’s work, for centuries. In the first century CE, the sect of neo-Pythagoreans construct a Pythagorean Temple underground, at Porto Maggiore in Rome. It combines elements of paganism and Christianity. It is the site of secret sacrificial rites, necromancy, and is filled with images of the Greek gods. At the same time, it has an apse and nave, a new architectural form built with the Pythagorean ‘golden mean’ like the Acropolis, but meant to represent the cross, the same architecture we see in the great cathedrals of the Christian Europe and even in the humblest wooden Baptist churches today. But the connection is more than architectural. All this would be just an interesting historical exercise if it weren’t for the fact that, in his vision of perfectionism and purity of form, Pythagoras still holds sway today. Indeed, Pythagoreanism is a fundamental of Western culture. It connects the Hellenic culture of the 5th c BCE of Plato, Socrates, and Aristotle with Roman culture. It connects Roman philosophy that dominated in the time of the destruction of the Temple with Christianity in the centuries soon to follow. It believes in the perfectability of man, and that matter is evil and corrupt. It believes reason needs to be freed and will free us. SOo it is easy to see how this Pythagorean wisdom lays the groundwork for the flowering of Christian theology soon thereafter, and the strict belief of Western science in rationality that blossoms fifteen centuries later. Pythagoreanism represents a continuous tradition of the perfectability of humans and the basis of the universe and everything in it as reducible to rational, deterministic, unified laws, Theories of Everything and a Grand Unified Theory. Greek philosophy forms the basis of a vision of the deities who created a clockwork universe of perfection, instituting immutable, static laws of physics and nature. The gods set it motion and let it run. This is a scientific cosmology that still holds sway today in the common mind. It still governs most of what we’re taught in school and our still Newtonian-Pythagorean concept of the universe. But this conception has nuanced, though absolutely critical, differences from Jewish metaphysics. Contrast the static Pythagoran philosophy of Being to our Jewish cosmology of an ever-blossoming, ever-unfolding, complex and imperfect world of Becoming. God’s Face is always receding and hidden, yet God’s attention continuously creates the cosmos. In Christian theology, the Word – Logos – becomes flesh. It is utterly knowable and personal.) Even the method of Jewish hermeneutics – how we argue and discourse to arrive at the truth – contrasts sharply with the Greek. You need only compare a page of any conventional Western book with a page of the Schottenstein Talmud to get the idea. One signifies a simple, clear stream of letters marching in lines across the page as the story proceeds in orderly fashion from beginning to middle to end. Open any page of the Talmud, however, and you are plunged into a hypertextual jumble: a noisy symposium capturing voices and commentaries and commentaries on commentaries separated by centuries and hundreds of miles and cultures. The choppy sea of Talmud exemplifies what Plato scorned as chaotic, subjective “aesthetika” and “rhetorika” as opposed to his orderly “logos.” The quintessential Greek text is the algebraic proof. The Jew’s is an argument. The subtle but fundamental incompatibility between these two philosophies leads to what I call “violence in the Judaeo-Christian hyphen.” With the burning of the Talmud throughout Europe and the many trials Jews have suffered under the rule of Christianity, including the Holocaust, this violence is not just philosophical. The twentieth century begins with work by Alfred North Whitehead and Bertrand Russell, Principia Mathematica, “showing” that all thought can be reduced to mathematically rigorous logic. They also say “Modern philosophy is nothing more than a footnote to Plato.” Later, in his History of Western Philosophy (1945), Russell declares Pythagoras the greatest of all philosophers. Interestingly, Russell’s last act, literally, in his life, is meant to shake the whole land of Israel. Though a pre-State supporter of Zion, his final political statement, read the day after his death in 1970 in Cairo, condemns Israel’s aggression against Egypt in 1967 and demands retreat to pre-1967 borders. In the 1920s, Martin Heidegger reinserts Pythagoreanism, an updating of the Greco-Christian Being vs. Becoming duality, into the heart of philosophy. Without going into his extraordinary influence over the twentieth century, including postmodernism and deconstruction, suffice it to say that virtually every thinker and theorist since has to grapple with Heidegger and has been influenced by him. However, two recent works of scholarship have exposed the truth of the Talmud’s prophesy in Sotah. Victor Farias, in Heidegger and Nazism (1987) and Emanuel Faye in Heidegger: The Introduction of Nazism into Philosophy (2005) show how Heidegger, who was an unapologetic and avowed Nazi, introduced Nazi violence into the scene of contemporary Western philosophy. His chief heir and leader of the Yale school of deconstruction, Paul DeMan, was exposed as having been a Nazi collaborator and writer during WWII. The monumental French thinker Jacques Derrida, himself an Algerian Jew, rose to DeMan’s defense in a shameful chapter in the history of postmodern thought. But let me end on a note of reconciliation. Realizing there is violence in the hyphen paves the road to recognizing the dead end of Pythagoreanism philosophy. The recent works by Farias and Faye expose the link between Nazism and empty philosophies of materialism, constructivism, deconstruction and moral relativism that have lain at the core of Western thinking itself, philosophies that lead to mechanization and disregard for the sanctity of all human existence. It is the same Greek wisdom that lies in the heart of the traitor of Jerusalem and is the source of ongoing Jewish assimilation to Western culture. In our newfound skepticism about the darkness at the heart of Heideggerian-spawned postmodernism, there is hope for a new redemption, I believe. This is especially true because the philosophical turn has been accompanied by a revolution in our scientific concept of how the universe works. Together, the two revolutions hold promise for how Jewish thinking may influence the future of Western civilization. There is a Universal Intelligence that by Its conscious attention creates and sustains the one universe we inhabit. This subject is obviously too broad and deep and abstruse to do justice to here, and I treat it elsewhere, but suffice it to say for now that modern cosmology is confronted with the a choice between two versions of reality, one absurd and unprovable, the other elegant and unprovable. The latter, though, introduces metaphysics, a Jewish-flavored metaphysics, back into physics. But don’t be confused: both the scientific and the explicitly religious versions of the universe are matters of faith. With thanks to classmates Boris Feldman, Josef Joffe, and Sam Tramiel, and special thanks to Rabbi Yitzchok Feldman, who inspired the first version of this piece in 2014. However, all foolishness, and errors in fact and judgement, are my own. Deep, entertaining, and forever to be continued.